After dying, getting a second chance at things isn't all it's cracked up to be for Kaylee. She's having a hard time adjusting to the fact that she isn't really alive, but only imitating life. It takes all of her concentration to keep herself visible, and avoid disappearing at the wrong moment. Things are even strained with her friends as they seem to have nothing in common anymore. Somehow things like prom and graduation just don't hold the same appeal anymore now that she will never advance past where she is now. And if those difficulties weren't enough, in exchange for that second chance, she has to reclaim stolen souls, and her first mission is turning out to be a doozy. Someone is stealing souls at an astronomical rate, and no one, not even Kaylee is safe. The characters more than anything, are really what makes this series so fantastic. Sure there is a whole lot of action and suspense, but it is the relationships (and drama) between the characters and their growth that really sets this series a step above the others. Of course, Tod and Kaylee are my favorites, (especially together), and I'll talk more about them in a bit, but the rest of the cast had some pretty shining moments as well. Sabine really grew on me now that she and Kaylee aren't battling for Nash. She may hide it well, but underneath her brash exterior she hides an extreme vulnerability and insecurity. She isn't as tough as she acts, and I found myself really starting to care for her, especially as Nash continued to break her heart. On the other side that mess is Nash, who is still undeniably screwed up and quite bitter especially towards Tod and Kaylee. But even there, some changes started and the healing seemed to start even though it will be a very long road ahead. There's one more character that really seemed to grow, and that was Kaylee's dad. Prior to this point he was trying to make up for being absent for so long by over-parenting Kaylee. However, now he seems to realize that wasn't really what was best for her, and the reigns are loosening just a little bit. I really love Tod and Kaylee together as they just simply seem to be made for one another. What she had with Nash can be described as nothing more more than puppy love as what she and Tod share is the real deal. More importantly, Kaylee understands that difference herself showing a huge amount of character growth. In If I Die, it was apparently obvious that Tod would do anything for Kaylee even if it meant giving up his own life, well "death." 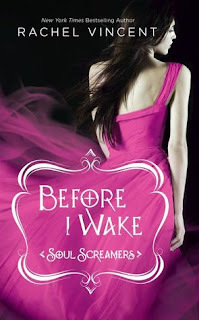 So I was really happy to see that Kaylee felt the same way in Before I Wake, although I would really hate to be the person in her path if she ever needed to save Tod, because things really wouldn't work out so well for them. With each book that is released in the Soul Screamers series, I wonder how Rachel Vincent could possibly top the previous one. Yet time and time again they do, with Before I wake being no exception. Considering the serious shockers and game changing events of the previous installment, this was no small feat. I felt like I was put through the wringer multiple times while reading this book. As emotionally drained as I was while reading Before I Wake, I cannot imagine the state my nerves will be while reading With All My Soul if the stakes go even higher. The wait until April 2013 will definitely be an agonizing one. A roller coaster of emotions, drama, and incredibly high stakes, Before I Wake simply cannot be missed!